Another load of old airliners... all in Sydney during the early to mid 1970s. This is one of 2 ex-Ansett Sandringhams prior to handover to Antilles Airboats in late 1974. 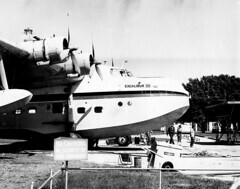 (1) 'BRC had the rounded nose of a more 'pure' Sandringham (even though it was a converted Sunderland) and was called 'Beachcomber', becoming N158C with Antilles Airboats in 1974. 'BRC is now landlocked, at Southampton, UK. (2) 'BRF, named 'Islander', was a 'near-converted' Sunderland with a blunter nose. It's now landlocked at Miami, Florida. I may not have taken this shot - I took a lot, but so did my late friend James Davidson, who had access to the Rose Bay base via his flight engineer father. James got me hooked onto black and white photography in the first place.